An E.L.F haul/review that I've been forgetting to post. Oh my god, I sneaked a peek at E.L.F website and they have new items again. :( I want the lip stains. 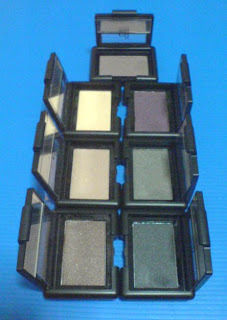 >.< Here's the Single Eyeshadows I bought from the E.L.F Studio line. These come in small packagings. I bought them all except maybe 3 colours. The colours in the picture above are not true. Refer to the website. It's almost true for all colours except Mystic Moss (which just looks like charcoal grey in the pan). These eyeshadows are relatively pigmented. Not the best pigmentation but good enough to be used. I tested everything with an eyeshadow primer (L'oreal De-Crease). Butter Cream: A rather unique shade. It's almost a gold but seems like a creamy yellow shade. Shimmery. Wild Wheat: A soft brown. Almost like Milo (a chocolate drink). Doesn't really appear on me but great as a all over lid colour. Coffee Bean: A dark brown with shimmers in it. My favourite. Gorgeous brown as a crease colour. Amethyst: Not really a purple. Maybe a plum. Definitely not what it looks like in pictures. It made my eyes look bruised (it might work better if I use a better eyeshadow primer since L'oreal De-crease doesn't really bring out the colours in Amethyst). Mystic Moss: Supposedly a mossy green but it looks like grey in the pan. Very close to Charcoal except it has some hints of green. I supposed I like it since it's more unique compared to Charcoal. Charcoal: A dark charcoal grey. Sheer and needs piling. Wouldn't give you that super intense dark grey you would want it to be. All the eyeshadows have at least a little bit of shimmers in it except for Pebble, which seems matte. I think they are fairly decent eyeshadows. Not fabulous but for the price I paid, I wouldn't mind buying. Overall, I think they are worth trying out if you like earth toned, more muted eyeshadows. Don't expect vibrant eyeshadows because they really are not. They are really on the dull/muted side but at least they have shimmers. Suitable for work. I would recommend just picking up a few shades to try if you are keen.